The manuscript - The Ross Sea Dipole - Temperature, Snow Accumulation and Sea Ice Variability in the Ross Sea Region, Antarctica, over the Past 2,7000 Years - takes advantage of the development of the RICE17 age scale which is based on an annual layer count for the past 2,700 years (Winstrup et al. to be submitted) and matching of high resolution methane measurements to the WAIS Divide and NEEM ice cores in West Antarctica and Greenland respectively (Lee et al., to be submitted). Our data show that for the past 2,700 years, the eastern Ross Sea warmed while the western Ross Sea showed no trend and West Antarctica cooled. From the 17th Century, all three regions warm, with dynamic changes in snow accumulation trends. A Ross Sea Dipole – opposing trends in the eastern and western Ross – Sea, is observed since the 3rd Century but is masked by longer-term trends. Reference: Bertler, N. A. N., Conway, H., Dahl-Jensen, D., Emanuelsson, D. B., Winstrup, M., Vallelonga, P. T., Lee, J. E., Brook, E. J., Severinghaus, J. P., Fudge, T. J., Keller, E. D., Baisden, W. T., Hindmarsh, R. C. A., Neff, P. D., Blunier, T., Edwards, R., Mayewski, P. A., Kipfstuhl, S., Buizert, C., Canessa, S., Dadic, R., Kjær, H. A., Kurbatov, A., Zhang, D., Waddington, E. D., Baccolo, G., Beers, T., Brightley, H. J., Carter, L., Clemens-Sewall, D., Ciobanu, V. G., Delmonte, B., Eling, L., Ellis, A., Ganesh, S., Golledge, N. R., Haines, S., Handley, M., Hawley, R. L., Hogan, C. M., Johnson, K. M., Korotkikh, E., Lowry, D. P., Mandeno, D., McKay, R. M., Menking, J. A., Naish, T. R., Noerling, C., Ollive, A., Orsi, A., Proemse, B. C., Pyne, A. R., Pyne, R. L., Renwick, J., Scherer, R. P., Semper, S., Simonsen, M., Sneed, S. B., Steig, E. J., Tuohy, A., Venugopal, A. U., Valero-Delgado, F., Venkatesh, J., Wang, F., Wang, S., Winski, D. A., Winton, V. H. L., Whiteford, A., Xiao, C., Yang, J., and Zhang, X.: The Ross Sea Dipole – temperature, snow accumulation and sea ice variability in the Ross Sea region, Antarctica, over the past 2700 years, Clim. Past, 14, 193-214, https://doi.org/10.5194/cp-14-193-2018, 2018. 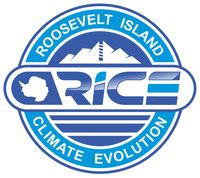 ﻿In this manuscript, 'A 2700-year annual timescale and accumulation history for an ice core from Roosevelt Island, West Antarctica' -w﻿e present a 2700-year annually resolved timescale for the Roosevelt Island Climate Evolution (RICE) ice core, and reconstruct a past snow accumulation history for the coastal sector of the Ross Ice Shelf in West Antarctica. The timescale was constructed by identifying annual layers in multiple ice-core impurity records, employing both manual and automated counting approaches, and constitutes the top part of the Roosevelt Island Ice Core Chronology 2017 (RICE17). The maritime setting of Roosevelt Island results in high sulfate influx from sea salts and marine biogenic emissions, which prohibits a routine detection of volcanic eruptions in the ice-core records. This led to the use of non-traditional chronological techniques for validating the timescale: RICE was synchronized to the WAIS Divide ice core, on the WD2014 timescale, using volcanic attribution based on direct measurements of ice-core acidity, as well as records of globally-synchronous, centennial-scale variability in atmospheric methane concentrations. Reference: ​Winstrup, M., Vallelonga, P., Kjær, H. A., Fudge, T. J., Lee, J. E., Riis, M. H., Edwards, R., Bertler, N. A. N., Blunier, T., Brook, E. J., Buizert, C., Ciobanu, G., Conway, H., Dahl-Jensen, D., Ellis, A., Emanuelsson, B. D., Keller, E. D., Kurbatov, A., Mayewski, P., Neff, P. D., Pyne, R., Simonsen, M. F., Svensson, A., Tuohy, A., Waddington, E., and Wheatley, S.: A 2700-year annual timescale and accumulation history for an ice core from Roosevelt Island, West Antarctica, Clim. Past Discuss., https://doi.org/10.5194/cp-2017-101, in review, 2017. New Funding to correlate RICE climate reconstruction with the high resolution IODP-1357U marine sediment record! Nancy Bertler, Rob McKay, Nick Golledge, Lionel Carter, Rob Dunbar, Matt England and Howard Conway are awarded a prestigious Marsden Research Grant. During the Mid Pliocene, 3-5 million years ago, high carbon dioxide concentrations (400 parts per million) caused vulnerable margins of the Antarctic and Greenland ice sheets to collapse, raising global sea level by at least 10 m. In 2013, the Earth's atmosphere registered for the first time since then equally high atmospheric carbon dioxide concentrations. So, how and when will the ice sheets and the surrounding Southern Ocean respond? Increased wind-driven upwelling of deep ocean water onto the adjacent continental margin is suggested as the major driver to melt ice shelves and destabilise ice sheets, highlighting the complex atmosphere to ocean to ice interactions. This project will integrate data from two new, annually layered records of past climate conditions preserved in a coastal ice core (RICE) and a marine sediment (IODP-U1357) record. This will enable the reconstruction of concurrent changes in the atmosphere, ocean, and ice sheet through past warm periods and grounding line retreat. Supported by ocean / ice sheet model experiments, this will allow us to determine the response of the Antarctic ice sheets and the surrounding ocean with the aim to identify the key mechanisms and feedbacks to improve projections of Antarctica's response in the 21st Century. The three year project will commence in March 2016.